In the past two chapters I wrote about the two ethnic cuisines that remind me most of home while being a student here in the city. In this chapter I am talking about the best Caribbean cuisine located in the Bronx. Caribbean culture was all very new to me when I first moved to New York. Previously living in California, I did not find as much Caribbean influence there as there is here in the city, due to its proximity to the West Indies. Since the early 1900s, Caribbean immigration to New York City had an influx of people from Jamaica, Haiti, Puerto Rico, and the Dominican Republic. While all the countries have slightly different styles in cuisine, the majority of the dishes consist of rice, beans, plantains, jerk chicken and oxtail. I asked a fellow coworker of mine where she thought was the best place to get Caribbean cuisine in the Bronx. She was originally born in the Dominican Republic, but eventually gained citizenship and was raised in the Bronx. Jokingly she told me the best place for Dominican cuisine was in her mom’s kitchen, but then she told me about a restaurant called Feeding Tree. Feeding Tree is located in the Bronx close to Yankee Stadium. Take the 4, B, or D train to the 161 St. Yankee Stadium stop and walk a short distance to the restaurant. 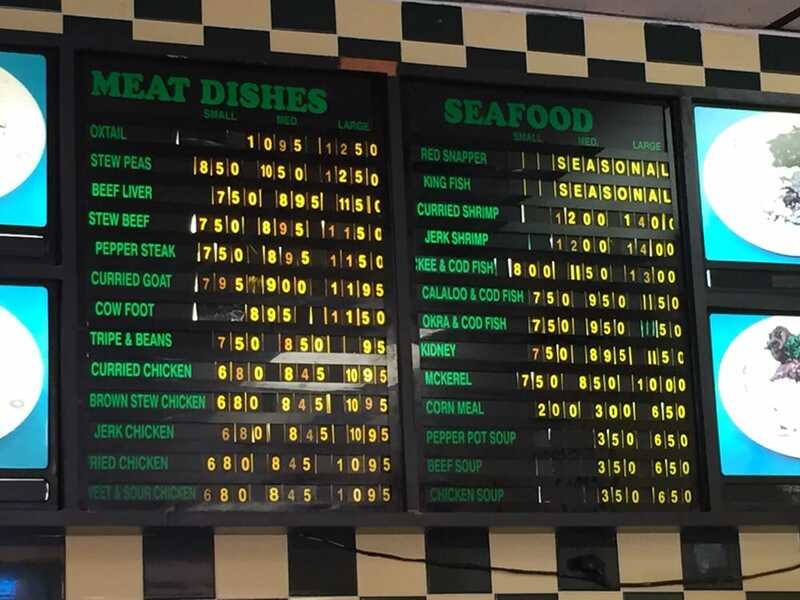 It is a very simply decorated restaurant and the menu has two columns “meat dishes” and “seafood.” You choose a dish, and then which size you’d like. Most of the dishes remain under or around $10. Feeding Tree’s most popular dish is the oxtail meat platter, which comes with rice and another side. The service is great; the portions are filling, and, most importantly, you can adequately taste the flavors of Caribbean spices. If you have never eaten Caribbean food before, you should definitely give it a try, especially if you are into Indian and Eastern Asian cuisines. Similarly to those cuisines, Caribbean food is very flavorful and takes ingredients from those places it has been influenced. If you are also interested in immersing more into Caribbean culture, this Labor Day weekend the 49th annual New York Caribbean Carnival is kicking off on Thursday, September 1. This four-day extravagant event will include street vendors cooking up authentic Caribbean cuisine, music filled shows, vendors selling Caribbean jewelry/crafts and a carnival parade on Labor Day. The festival will take place in Crown Heights with the parade on Eastern Parkway. Next week, for my final chapter on ethnic cuisine outside Manhattan, I will be talking about the various food festivals that offer diverse options in cuisine all in one place! Tricia Vuong is a publishing intern here at the Campus Clipper. She is currently studying Journalism + Design at Eugene Lang The New School for Liberal Arts with a minor in Global Studies. Check out more of her work on her portfolio. Stay tuned for more tips from Tricia on ethnic cuisine outside of Manhattan, check our website for more student savings and watch our YouTube video showing off some of New York City’s finest students during last year’s Welcome Week. Once you’ve moved in, you need to be aware that you no longer have an R.A. on your floor. You probably won’t have a doorman either. And there probably isn’t a mailroom or package center, so you’ll be the person signing for incoming packages. In certain situations, there are fool-proof ways to ensure you never have a problem. Don’t lose keys or get locked out by giving someone who doesn’t live in your building an extra set. That way, in an emergency you can reach them and don’t have to pay for a locksmith. While dorms have R.A.s you can speak to when there are building issues or problems with your neighbors, the reality of apartment living is that you are essentially on your own. If there is a problem, you will have to speak with the people you’re living with. Sometimes, to avoid this issue, you can leave a note in your hallway. But the best thing to do is probably knock on the offender’s door. You’re not going to get peace and quiet 24/7, but if it’s been multiple weekdays of 3am parties, it doesn’t hurt to remind your neighbors that you are a student, and you would greatly appreciate their understanding that while you don’t mind parties, you do need some sleep. If you don’t get the response you want, talk to your landlord or other neighbors, and see if there is anything that can be done. If something in your apartment breaks, such as your toilet or stove, call your super. It’s his responsibility to take care of repairs, as long as the appliances broke down for reasons not directly related to you. Always remember that you’re renting the space, so, when you leave, everything needs to be in the same condition you found it in. There will be minor wear and tear, but there shouldn’t be a myriad of issues when you leave, or you’ll risk losing your security deposit. I am a first generation Asian-American being half Vietnamese and half Chinese. My first language was Cantonese and I grew up eating Chinese dishes. My childhood memories are comprised of going to the Cleveland, Ohio’s Chinatown and eating dim sum on Sunday mornings. Dim sum was always a family event and the whole chaotic experience of ordering from the ladies pushing carts full of dumplings became familiar. Similarly to my last chapter, there are several dishes that remind me of home here in New York. In the last chapter I wrote about the best taco spot I’ve found that tasted and cost as close to the tacos back home in Southern California. This chapter, I am writing about the best Chinese dim sum and dishes that remind me of my childhood. If you must settle for the Chinatown experience in Manhattan, there is one dim sum place I have been attending that has been able to avoid tourists and remain under $10. 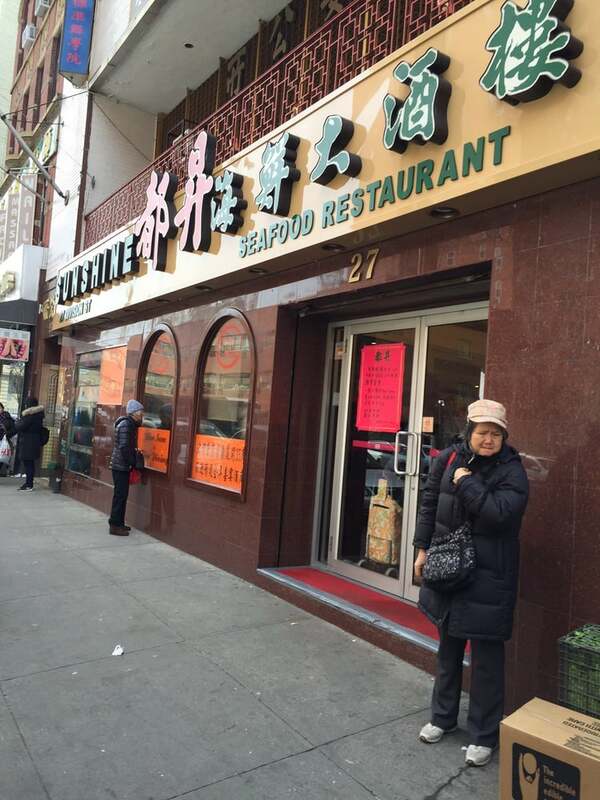 Skip the Yelp suggestions of Golden Unicorn, and Jing Fong and visit Sunshine on 27 Division Street. After several trials to other dim sum restaurants in Manhattan’s Chinatown, Sunshine is the most authentic I’ve tasted. 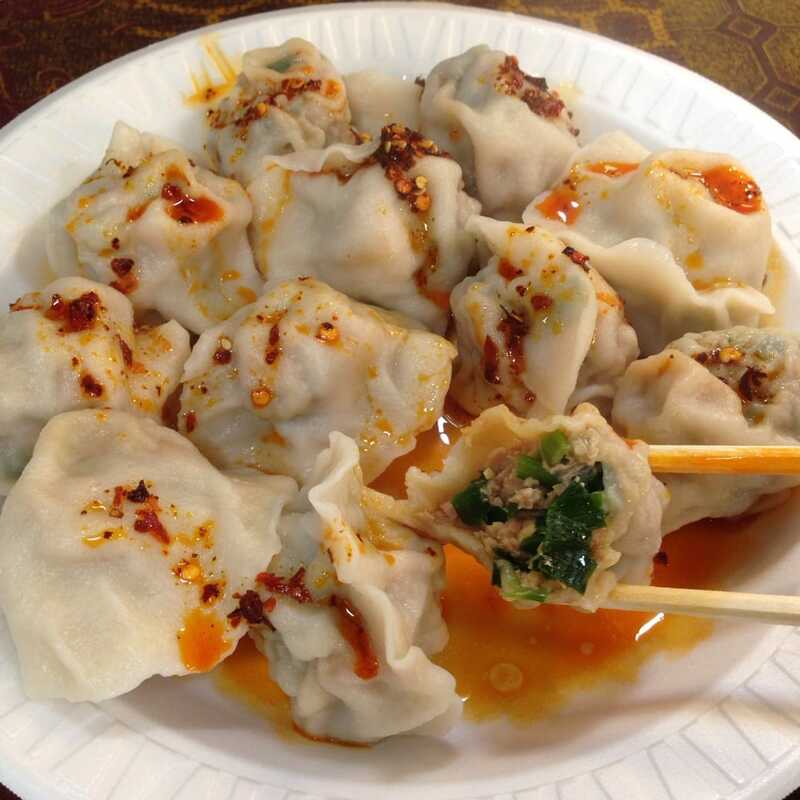 It is a smaller restaurant unlike the very extravagant experience you’ll receive at Jing Fong, but the dumplings are always fresh and fairly priced. As most dim sum restaurants, the ladies push carts around the room filled with different types of dishes. 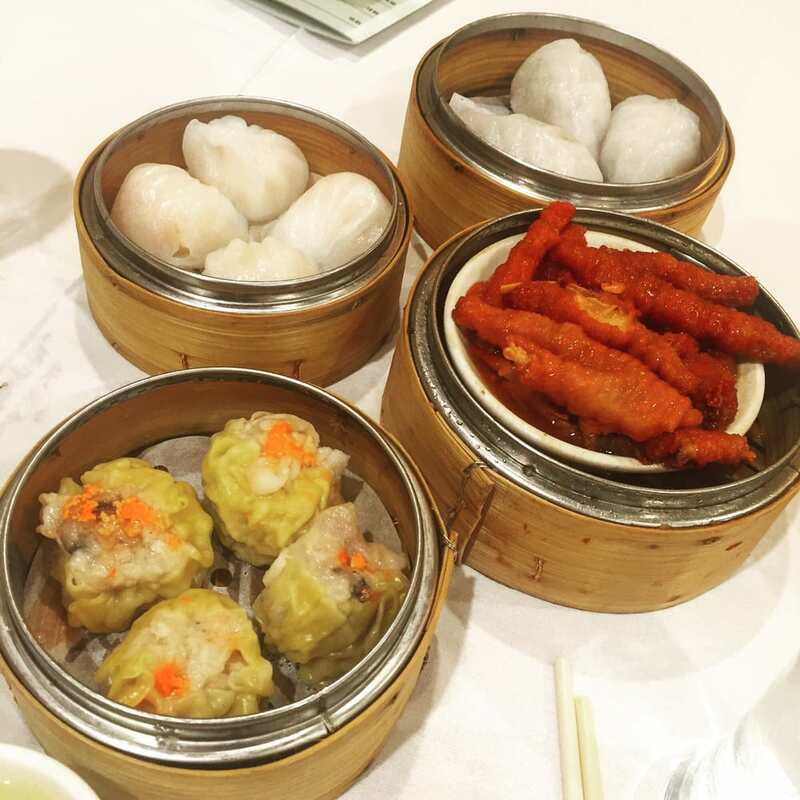 The most popular dim sum dishes are typically har gow and shu mai. Har gow is shrimp encased in a rice paper dumpling and shu mai is a pork dumpling. The best part about Sunshine is that you share a large table with other parties similar as how they do in Hong Kong. Your party will get a complimentary pot of tea and the rest is up for you to decide what you want from the carts! There are a few vegetarian options but most of the dishes do contain meat so the dim sum experience isn’t for picky eaters. Don’t be afraid to point and ask to see what the dishes are. The ladies speak both Cantonese and Mandarin and although there can be a language barrier for those that do not know either, most of them usually show you what they have. Walking down Canal Street you pass numerous vendors that are trying to appeal to tourists. If you want to skip the hustle and bustle of vendors selling knock off bags in Chinatown Manhattan, try a different kind of chaotic experience in Flushing, Queens. If you’re coming from Manhattan, hop on the 7 train from either Grand Central or Times Square. Take the 7 train all the way to its last stop, Flushing Main Street. There you will get off and be in the center of another Chinatown minus the tourists. Flushing, Queens offers two Asian malls equipped with clothing and grocery stores along with a food court. The New World Mall is a more Westernized experience while the Golden Mall is comprised of small hole in the wall shops. Both are within walking distance from the train stop. Check out the food court in both the malls as they have a variety of options such as hand-pulled Shanghai noodles and dumplings. As for dim sum in Flushing, Asian Jewels Seafood Restaurant offers tasty dishes and a great ambiance. 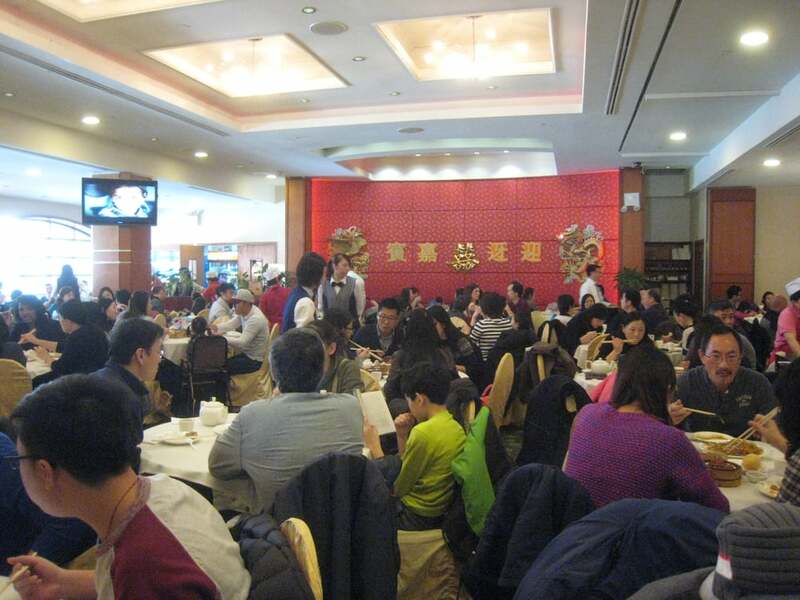 Most dim sum restaurants are in large banquet-like rooms with white table cloths and red walls. Jing Fong and Golden Unicorn in Manhattan’s Chinatown appeal to the traditional dim sum aesthetics but their quality in the actual dishes are lacking. Asian Jewels in Flushing meets both of these points to having a great dim sum experience while also remaining budget friendly. Dishes are marked on your party’s stamp card in either the small, medium, or large section. You don’t really know what each dish costs unless you ask, but at the very end of your meal the waiter will total everything up. I’ve gone with a party of six and a party of just two and each time I hardly spend any more than $10. Sunshine in Chinatown, Manhattan and Asian Jewels in Flushing, Queens are the two tastiest Cantonese dim sum restaurants I’ve had here in New York. While you shouldn’t be suspicious of everyone in New York, you need to be on your guard around your landlord. One of the most common issues with landlords is that they find reasons to not give you your security deposit back. In order to ensure this doesn’t happen to you, and no long legal battle ensues, demand a walk-thru and a walk-out when you move into the apartment and exit. If your landlord doesn’t want to do this, request the super does it with you instead. Take plenty of pictures of the floors, the appliances, and the walls as you’re moving in. If there are any major problems with the apartment, bring them to the attention of your super and landlord as soon as possible. You may think some scratches on the floor or a dent in a door isn’t a big deal, but your landlord may attempt to hold onto part of your security deposit, claiming there was damage done. If you take extra steps in the beginning, you won’t have to deal with a larger problem later. You should keep both your super’s phone number and your landlord’s number saved in your phone, especially if your super doesn’t live in the building. Additionally you should familiarize yourself with a list of tenant rights and responsibilities, which can easily be found online. If you are a New School or NYU student you may have already tasted Vapiano’s simple and tasty Italian offerings at a catered school event. 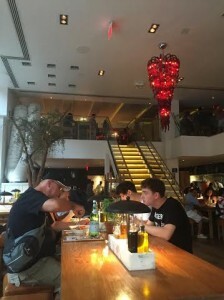 If you’ve traveled around Europe, it’s also very likely that you walked into a Vapiano – the international chain has over 130 restaurants worldwide. 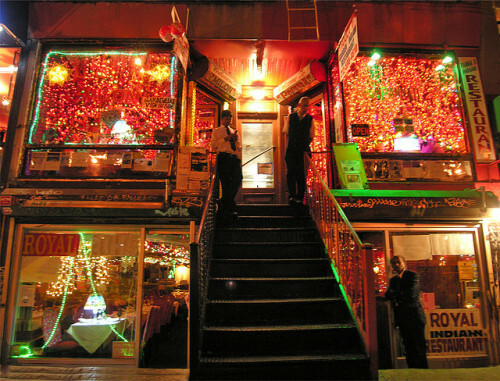 Their New York outpost is a large, two-story restaurant on the corner of University and 13th street. 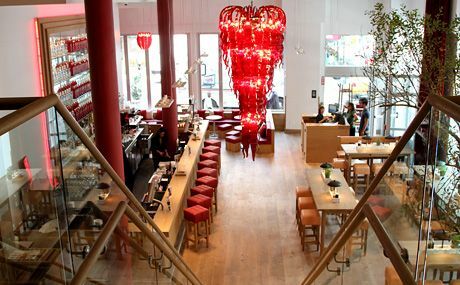 The space is airy and open with red globe decorations hanging from tall ceilings and big windows. Don’t be put off by the large air-conditioning rig coming out of one of the windows when you walk in. What’s most unique about Vapiano is their card system. When guests walk in they are automatically asked if they’ve been to the Italian chain before – that’s because their ordering system may seem unusual at first but is pretty simple once you get the hang of it. 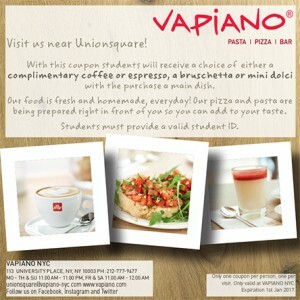 You’re handed a Vapiano card, which is similar to a credit card but just for the restaurant. 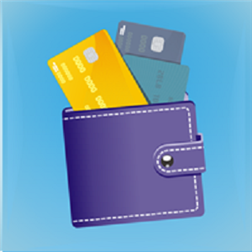 Every time you order, your card is scanned and when you are ready to leave, you hand the card in at the front desk and pay based on the card’s balance. The idea is upscale cafeteria-style. You don’t order at a table, but rather walk to stations offering different options (pasta, antipasti, pizza, salad…) with a tray. At the pasta station, dishes are sautéed up before your eyes and you scan your card by tapping it against a machine after ordering. If you decide to go for a personalized pizza, you’ll be given a little buzzer which rings when your dish is ready. Pasta and pizza dough are made fresh, in house daily. 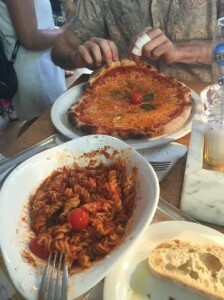 Vapiano’s pasta bolognese and margharita pizza. Photo by Tamar Lapin. Le Ludwige, the manager at the New York location says that this system is meant to encourage guests to roam the restaurant freely. “We wanted to give our guests the option to walk around,” he said. Ludwige added that this system does slow down the ordering and paying process slightly but they are working on streamlining. As of now, lunchtime can be a little slow, as business-lunch people in the area want something they can sink their teeth into more quickly. But if you’re a student with a big break in between classes, Vapiano is perfect. You can also order online through Chow Now and come pick up your meal all ready to go. This option is also great for families, and on a Friday afternoon, the restaurant is filled with European tourists and groups of young people. You and your friends can each go to a station and meet at one of the high lightwood beige tables with your steaming dishes. For a touch of simplicity, try the pasta bolognese, a traditional Italian dish- made with Vapiano’s classic beef and pork tomato sauce, with sliced carrots as a delicious and surprising addition. The dish is well-seasoned and filling. All pasta dishes are served with two slices of homemade bread and each table is outfitted with little marble containers holding spicy olive oil and balsamic vinegar. The pizza is less of a highlight, the classic margarita I ordered was a little greasy but the European-style thin crust redeemed it slightly. All the dishes are priced reasonably at $10.00 to $13.00. If you’re in the mood for a drink, Vapiano has an extensive wine selection showcased on tall mirrored shelves behind the bar. Glasses of wine are priced at $9.50 and the beer is $6.50. Visit Vapiano to satisfy all of your fresh pasta cravings and bring your classmates for a tasty meal in a fun, low-key environment that is guaranteed to have you leave as friends. I grew up in Orange County, California and Mexican food was available almost everywhere. From authentic taqueria spots that were open twenty-four seven to chain restaurants like “Rubio’s” that had specials like fish taco Tuesdays, you could find a great dish on any block. After I moved to New York, I was determined to find a great Mexican taco spot that was also cost-friendly. When I lived in the city during my first year, I noticed that although there were Mexican restaurants, many of them were overpriced for portions that were not very filling. Even the Mexican chain, “Chipotle,” was slightly more costly here in the city compared to back home. After I moved to Bushwick, Brooklyn, I finally found a taco spot that tastes as great as it costs. Bushwick, Brooklyn is historically and predominantly Hispanic. Most residents are Latino: from Puerto Rico, the Dominican Republic and immigrants from Mexico. 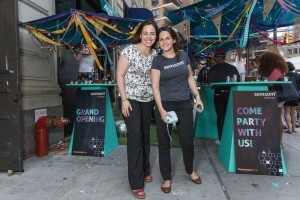 Bushwick is the largest hub of Brooklyn’s Hispanic-American community with residents that have created businesses to support their own national and traditional cultures. Take the L or the M train to the Myrtle-Wycoff subway station and walk a short distance to Taqueria Izucar. Located on the busy Myrtle Avenue between Menahan and Grove Street, this small business has a red awning that you can’t miss. When you walk in, there is just a small counter and a few open bar stools. Most people take their dishes for take out and they also do delivery if you’re in the neighborhood. Along with tacos, Taqueria Izucar offers other traditional dishes such as tortas, tostadas, enchiladas, and others. Their most popular taco is the “suadero,” which is a veal flank taco. Each taco comes with two corn tortillas, cilantro, onions, radish, lime, and salsa. Depending on the meat, prices vary but most of them are $1.50 per taco. If I am hungry, I typically get four tacos which costs only $6, an amazing deal! Even the taco truck outside the Myrtle-Wycoff subway station sells their tacos for $3+. All the dishes are made to order and they also accept both cash and card payments. Currently Taqueria Izucar only has 33 reviews on Yelp, but a four star rating. New York Magazine says, “They know their way around a taco at this unexceptional-looking counter-service spot under the rumbling M train.” and the Village Voice has named it their “Best of NYC’s” taco in 2013. 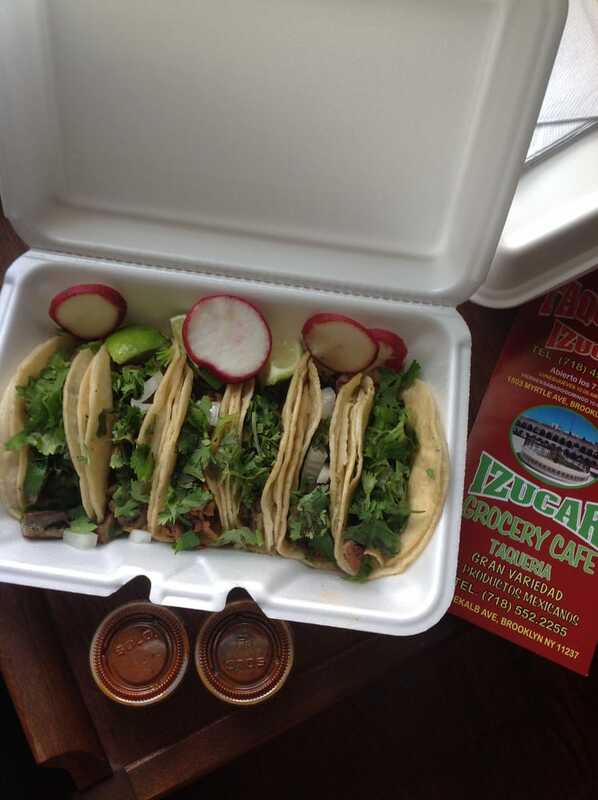 Be sure to visit Taqueria Izucar for some authentic tacos that won’t kill your budget. Next week, I will be writing about the best dim sum in Flushing, Queens! I know it seems like we’ve been building up to this for a while, but the final thing you should do before you go out and search is to make a list of things you do and don’t want in an apartment. While this may sound silly, it’s easy to get overwhelmed after looking at multiple apartments, and forget what is important and what isn’t. Once you have your list, come prepared. Bring a camera, pens, notebooks, and if you can, someone besides the person you’re living with. A parent or some other mentor is always helpful because two heads are better than one. They may be able to point out something you haven’t considered. Don’t forget to ask about building amenities, such as laundry. Check the water pressure of sinks and the shower. Consider how many flights of stairs you’re willing to walk up. Take your time when you’re in the apartment, and feel things out. While Craigslist.org has gotten a bad rap, it’s a great resource for finding apartments straight from the previous renter. But if you’re wary, there are other great resources. Your college/university usually has resources for students. There’re websites like nofeerentals.com you can use. You can also go with a broker, but, unfortunately, there are fees involved—sometimes as high as 15-20% of a year’s rent. It’s better to cut out the middle-man and find an apartment through other resources. You should start looking 6 weeks to a month in advance. 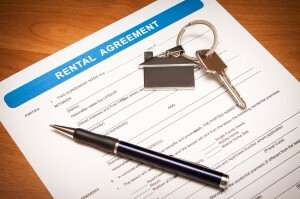 Anything prior will be tricky, as most rental apartments are trying to be turned over quickly. Schedule looking at many apartments during the course of a day, and then narrow down your choices after a few of these excursions. It’s common for the person you want to rent from to pressure you, letting you know the apartment will go off the market soon. And though the turnover rate is fast, it’s better to make sure you really like the place than feeling panicked and rushing into a decision. 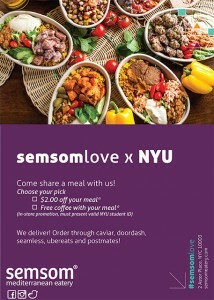 With Halal carts on every corner and hundreds of Middle Eastern restaurants all over the city it didn’t seem like we needed another one but Semsom, located at 2 Astor place, serves up fresh twists on old favorites that will have you coming back again and again. The fast-casual Middle Eastern eatery was opened by two creative sisters Christine and Carine about a year ago but is already an institution in the Middle East with locations in Lebanon, Oman, Ksa, Kuwait and an upcoming location in Dubai. Already, a successful businesswoman- Christine is responsible for bringing Dunkin Donuts to the Middle East and was named Best Businesswoman in the Middle East in 2011- Christine’s dream was to share her passion for Lebanese food with the world. Sisters Carine and Christine at Semsom’s grand opening. Photo courtesy of Semsom. 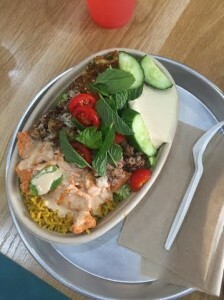 Walking into Semsom Eatery will immediately transport you to a calm, cool Middle Eastern villa. The restaurant is clean and airy with turquoise accents and you almost expect a seaside breeze to hit you. It’s clear that the concept is to make you feel at ease and at home, with comfortable and ample seating and personalized touches. The wallpaper is a dynamic photo of a friend of the two sisters in their father’s old car. The restaurant sells scrumptious French treats by Michel et Augustin that Carine loved when she lived in France and the recipes of Semsom’s delicious offerings are based on family recipes that the sisters loved to devour as children. An upcoming location in the Financial District will even have the window shutters from Christine and Carine’s childhood home. The concept is simple and streamlined- walk up to the counter and choose either a bowl or a wrap, the bowl is recommended because it allows you to taste each dish individually, and you definitely will want to capture each of the unique flavors. You can choose lettuce or rice as your base (or half and half). Then, choose between two chicken dishes, two meat dishes and two vegetarian options. The Taouk chicken- simmered in vinegar tomato sauce and paprika is tangy, moist and flavorful. One of the vegetarian options- the wild thyme cauliflower is oven roasted with sumac and dried thyme, earthy and filling it will have even non-vegetarians salivating. You can then add two flavors such as pickled mushrooms or cabbage, tahini carrots, minted yoghurt, hummus or sweet and sour eggplant. The eggplant is a definite hit, made with pomegranate molasses it has an interesting zesty taste with sweet undertones. But the definite standout on the bowl is the hummus which is made with fresh chickpeas (never canned!) and soaked in water overnight. Lea Ghandour, Carine’s friend who heads marketing for the NYC branches tells me that the hummus, “takes 12 hours to prepare and two minutes to devour.” And she’s right! Using fresh chickpeas makes the hummus ultra creamy and smooth. You can slather it on any of the dishes or eat it by the forkful. Make sure to top your bowl with some mint leaves for an even fresher accent. 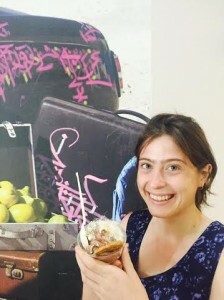 Tamar trying some delicious vegan soft serve at Semsom. It’s all affordable too! Prices range from $7.00 to $8.50 for wraps and from $8.00 to $11 for bowls. The food is simple, bright and colorful and all seasonal and locally sourced. The beef comes from New York institution Pat LaFrieda and the chicken is free-range and antibiotic free, all halal. Everything is flavorful and evenly spiced with an air of simplicity that’ll make you want to try to recreate the recipes at home. And you can- the owner’s thinking ahead set aside a corner of the restaurant- a souk of sorts which sells spices used in the recipes: turmeric, sumac and zaatar. You can also buy some of the sisters’ favorite cookbooks, handmade soaps, and cute, colorful clay cups. In a rush? Grab one of Semsom’s readymade seasonal salads to go like the watermelon feta salad or indulge with a serving of sriracha hummus and some healthy pita chips. One of their new offerings, the vegan soft-serve is also a definite must-try. It comes in flavors like chocolate halva and frozen mhalabiyeh (rose and orange blossom water). Get some candied chick peas to sprinkle on top and you are set. 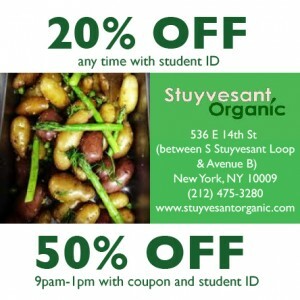 Being a college student in New York City allows you to have an array of food options to choose from. New York food staples such as dollar slice pizza and bagels are among these options. Say your taste buds are feeling a more unconventional dish, you’re also in luck because the city is filled with people from an array of diverse cultures, and the ethnic dishes they make. When I first moved to New York two years ago, I was delighted by the variety of food choices I had. If I wanted to eat pad thai one night and pierogies the next, I could. There is a Chinatown, Little Italy, Ukrainian neighborhood, and a number of Indian restaurants in Murray Hill all within one borough. Manhattan is filled with neighborhoods that specialize in a particular cuisine because of the communities that immigrated here. Although it is filled with many diverse ethnic cuisines, I noticed that some of the places were overpriced and had an over the top aesthetic feel. I realized that if I wanted to have a more authentic experience trying these dishes while remaining within my student budget, my best bet would be to venture outside Manhattan and into the outer boroughs. I am from California and grew up eating authentic Mexican food including street tacos for 50 cents, and also authentic Vietnamese cuisine. Little Saigon, the neighborhood I lived near in Southern California serves a large bowl of pho for three dollars. These are the dishes that remind me of home and I was determined to find places in New York that could comparably make these similar dishes and offer them at a reasonable price. I highly advise students to explore other boroughs outside of Manhattan. 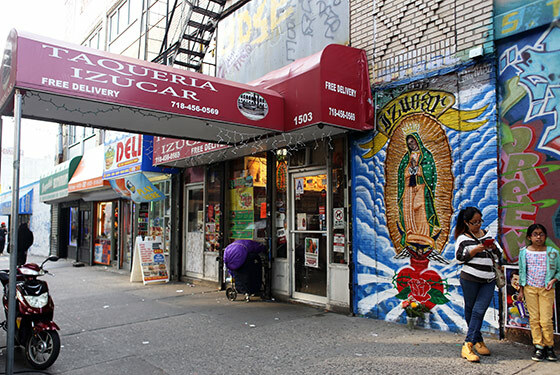 If you are craving Mexican food, instead of opting for the local Chipotle around your apartment or over-priced trendy taco place in the city, venture out to Bushwick in Brooklyn. In my following chapter, I will be writing more about the best taco spot I have found that reminds me most of Southern California, and it is by far the cheapest taco place I have found in the city! In the following weeks, I will write more about the best dim sum in Flushing, Queens, Dominican food in the Bronx, and international food festivals that occur here in New York. If you’ve been living in a dorm or your parents’ house up until this point, you’re going to experience a new form of expenses: utility bills. It is very rare in New York City to have an apartment with utilities included (though hot water and heat must be provided by your landlord). The rates for electric bills alone are staggering, and if you engage in the behaviors you likely did pre-electric bill paying, you’re going to find yourself dealing with almost triple digit sums at the end of the month. In addition, there are no dining halls in apartments, so you’re going to have to have a food budget. And since you’ll probably be cooking, you’ll also be paying a fee for the gas that powers your stove and oven. With this in mind, it may be helpful to make a list of all the estimated expenses, so you have a better understanding of what financial life will be like once you’re in your own apartment. And if things seem a little too extravagant, brainstorm with your parents and roommate on how to keep costs down. Remember to unplug your laptops, chargers, etc. in order to keep your electric bills reasonable. And if you know you won’t be using your stove at all, call Con Edison and tell them to turn off your gas, otherwise you’ll still be paying $10-20 a month for a service you’re not even using. You’ll also have to decide whether to get Internet and/or cable television. Some people find cable a luxury that’s not realistic or affordable. So opting for a cell phone and Internet in lieu of a landline and cable can be a good option. Also, to help avoid food budget problems, consider going to farmer’s markets instead of the grocery store. The Union Square Greenmarket has in-season produce, which keeps costs down, and the prices are sometimes negotiable. And when going to the grocery store, bring coupons and stick to a list to avoid impulse shopping and overspending. Make delivery a treat when you’re in the middle of finals week and need a break without wasting time. And if you save going out to eat for special occasions, you’ll enjoy saving money and the occasional indulgence.